Dog lumps are not all that uncommon so sooner or later, the time will probably come when you find one on your Miniature Schnauzer. Well, don’t panic. There is good news... Not all lumps, bumps, and cysts are cancerous. In fact, it’s quite the opposite. Most skin growths on dogs are benign (non-cancerous). This article is aimed at providing you an overview of skin growths, as well as share with you our own personal experience with them. One of the best ways to stay in tune with your dog's body and help you find arising problems early on is by performing a weekly checkup on your dog. And if you do come across any abnormal growths on your Schnauzer (whether it's an external bump or scab on top of the skin or an internal mass below the skin’s surface) go ahead and make an appointment to consult with your veterinarian. He will examine your pet and evaluate the dog lump in order to determine the best course of action for your Schnauzer's well-being. OUR STORY: In our case, the first bump appeared on our Mini Schnauzer at the age of 2. It was just a small black dot on his back, no bigger than a pin head and was believed to be a Schnauzer Bump (that ended up not being the case). At the time, our vet charted the size, color, and location of the abnormality and off we went. A few years later, I felt two small dog lumps forming beneath the skin; one on his lower back and one on the back of his neck. They were very small and again the vet sized and charted them, and gave us no cause for alarm. Over the next six years, however, the black bump that first appeared at age 2 had grown considerably (see pic above) and now another one appeared on his head, just above the right eye. I knew it was a different kind of bump just from the texture of it. The original bump had a smooth rubbery feel to it and this one felt a little rough almost as if it was a scab. Plus there were 2 more tiny black bumps emerging on either of his ears. "We should probably have these removed and tested." It’s a scary feeling to even think about cancer, chemotherapy, and radiation. But the old tumors had grown in size large enough to cause my vet concern and so... surgery was scheduled. 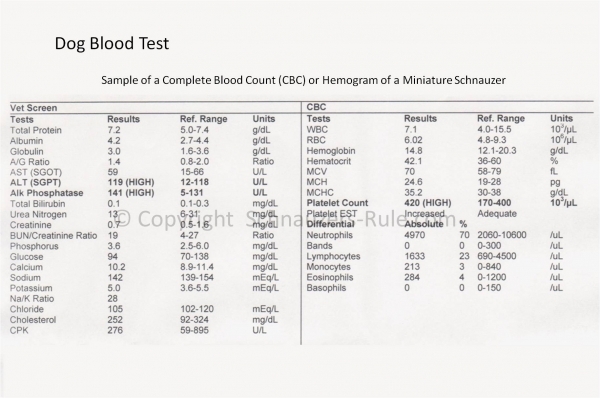 Prior to surgery, my Schnauzer had both blood and urine tests performed to ensure there were no underlying health issues that might make undergoing anesthesia and surgery risky for him. See test result samples: Dog Blood Test Analysis and Dog Urine Test Analysis. On the day of surgery, they prepped my dog by shaving and disinfecting areas of his body surrounding the lumps being removed. Anesthesia was then administered so he would be asleep and pain-free during the procedure. Incisions were made and the dog lumps and bumps, including some of the normal tissue surrounding them, were removed completely. The vet used two layers of suture material in all the skin incision lines: conventional stitches, which the vet would remove in 10 days and internal stitches that will dissolve or go away on their own, over the next 3 to 4 months. Several hours after surgery and after making sure my dog was stabilized, I was able to take him home. The six nodules removed from his skin were sent to the lab and pathology results were expected in a couple of weeks. In the meantime, our instructions for recovery included antibiotic tablets (Amoxicillin) given every morning and evening for four days. Anti-pain tablets (Tramadol) to help control any pain and discomfort. Hot packing which is done by dipping a hand towel in a pan of luke-warm water, ringing it out and then holding it over the incision lines for 5 minutes (2 or 3 times a day). Hot packing increases blood flow to the incision areas to speed recovery and also helps to decrease pain. And of course, I had to make sure to keep my Schnauzer from trying to lick or scratch any of his incisions. 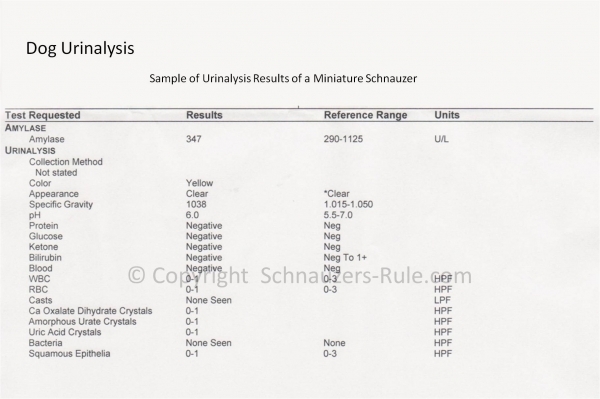 Pathology Results: The photo below shows the location and diagnosis of the types of growths found on my Miniature Schnauzer. The masses were all benign and removed completely. Recurrence is not expected. Whew… glad that’s over. Epidermal Cysts: The cysts or the lumps that formed under his skin were Epidermal Cysts. These types of growths are common and non-cancerous. They are slow growing and usually asymptomatic. Fibroma: The large raised bump on my Schnauzer's back that first appeared when he was about 2 years old. Over the last 6 years it grew to be quite large (see top photo). It was black and felt a bit rubbery. Turns out it is a benign fibroma composed of connective tissues. Sebaceous Gland Adenoma: These are common bumps or nodules that may have a crusty exterior and filled with pus. They are more common in older dogs and usually found on the head and legs. The findings of all masses are benign (non-cancerous) and were removed completely. Recurrence is not expected. Hallelujah! 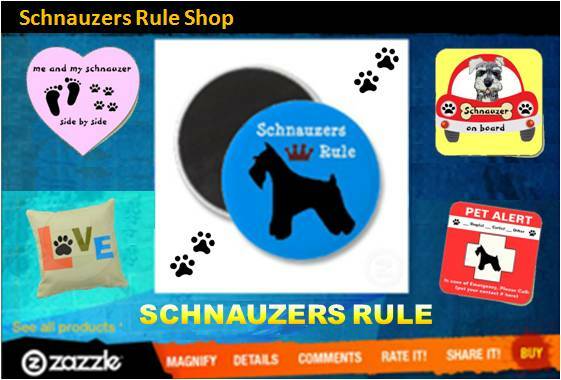 Here is a list of 6 non-cancerous or benign lumps you may find on your Miniature Schnauzer. Abscess: This is a swollen and often painful area within body tissue that contains an accumulation of pus. Lipoma: A benign tumor of fatty tissue (a fatty tumor). Fibroma: A benign fibrous tumor of connective tissue. It is usually a raised hairless nodule that feels firm and rubbery or it could be soft and movable. 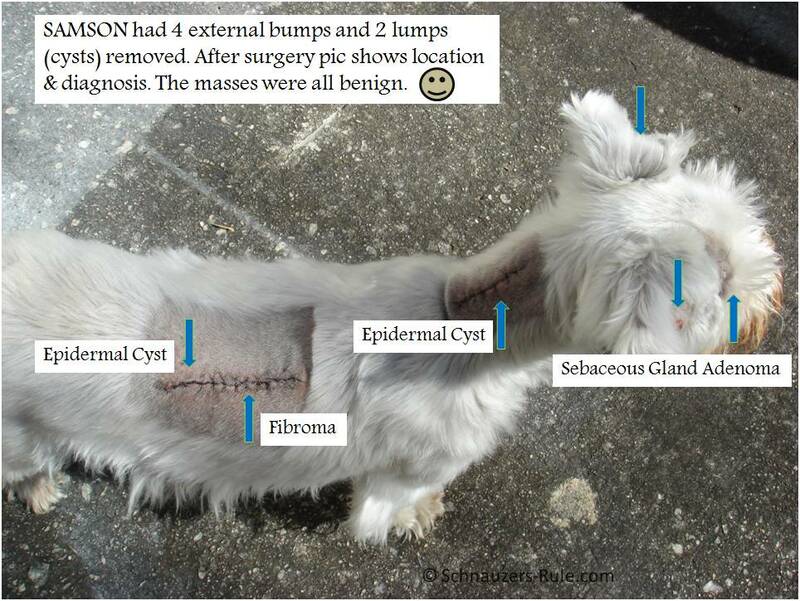 Sebaceous Gland Tumors: Common lumps or dog bumps that have a wart-like appearance and are usually found on a dog’s head and legs. 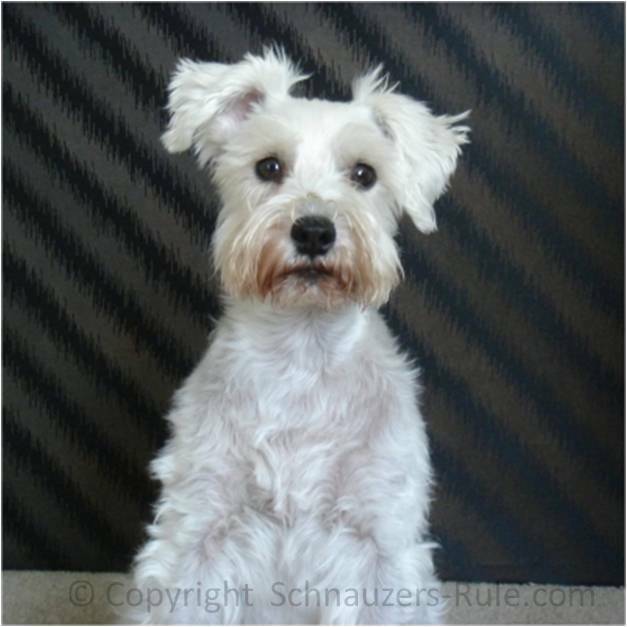 Schnauzer comedo syndrome: These are small tiny bumps that will come and go on your Mini Schnauzer. They usually appear on the dog's back and are harmless. Hopefully after reading our own personal experience with dog lumps, bumps, and cysts and realizing that it is not all that uncommon for dogs to get these skin growths over their lifetime, you will feel a bit more at ease if and when you do find a dog lump or bump on your Miniature Schnauzer. Just continue to perform at-home checkups on your dog and consult with your veterinarian for an evaluation if you do find anything suspicious. early detection is the key to successful treatment of most cancers. "Knowledge Share"... If you found this article on common dog lumps helpful and informative, please share it with your dog-loving friends by clicking on one of the share links (like facebook, twitter, and google +1) located at the top right or bottom of this page. Or post a comment below on your own personal experience.